Literacy and numeracy are the cornerstones of education, and are generally considered critical life skills. The Davis® methods can be used to improve both literacy and numeracy dramatically over the course of 30-50 hours. DDAA does not set a fixed price for the Davis Dyslexia Correction programme, so please check pricing with each facilitator. When Each programme is done separately, it generally takes around five days (30 hours), but if they are done consecutively, or together, they tend to take less, due to the fact that there is considerable overlap in the "curriculum" for each programme. How many days are you likely to need (5 or 8-9 days) The result of the assessment is discussed at he end, but we do not provide a written report. If you wish to book a professional Davis Assessment, please go to our team page and choose a facilitator to contact. It is best to choose a facilitator for the assessment, who you think is likely to be a good fit for an eventual programme. This programme is to address reading, writing, and spelling - generally in five days. We customise our programmes in order to address your individual needs. If you work with us, we will tailor a programme specifically for you, based on your age, goals, and symptoms profile. We will also schedule the work as much as we can to fit in with your requirements, though most commonly we do an intensive programme consisting of six hours a day, over five days. When working with a younger child, we are likely to spread the work more, and work for shorter time each day. Following the five-day programme there is about 50 hours of work to be completed at home with a support person of your choice, which we give basic training in how to support you. When addressing ADD and AD/HD issues we often begin by addressing literacy, as there is often an underlying issue with literacy. 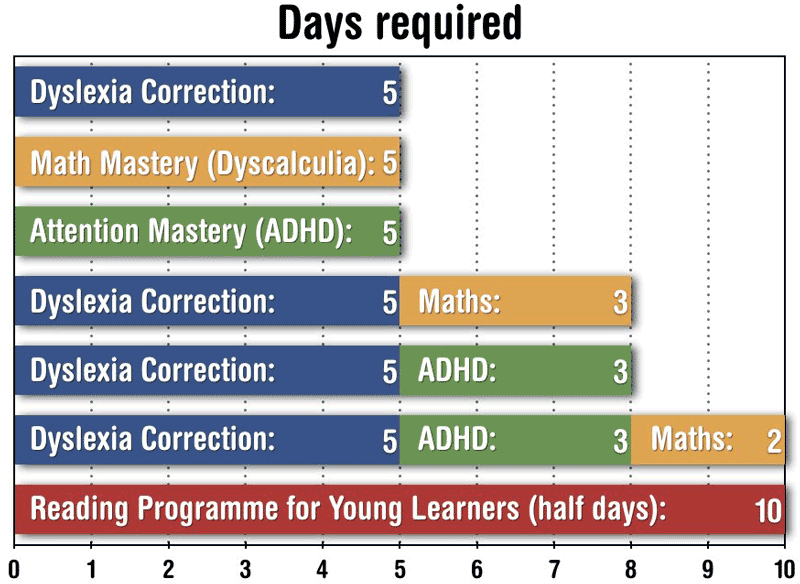 If there are no problems with literacy, then we generally complete all the literacy work within a day or so, and in that case the Attention Mastery Programme can be completed in about five days. If there are issues with literacy, then it is likely to take eight days to deal with both literacy and ADD (or AD/HD). If there are maths problems as well, then we might need to add a day or two, possibly taking the whole programme to nine or ten days. The Davis Reading Programme for Young Learners is an individualised learning enhancement programme with a licensed and trained Davis Facilitator. Its mission is to give children aged 4-8 the best possible start at the outset of their learning career. To provide lifelong learning skills to younger children through a partnership between Facilitator, child and parent(s). To give one or both of the child’s parents, or a support person, sufficient confidence and skill to continue working with the Davis Young Learner’s Kit after the programme. Identity Development: ​ Learning about ‘life’s natural lessons’ by creating models in plasticine clay and exploring these concepts in the environment. Social Integration: Focused on building social awareness through exploring the different types of relationships we have with others, allowing those with ASD to participate more fully in life. You can buy The Gift of Dyslexia book and follow the instruction therein. This is obviously not as secure in terms of success as working with a professional, but it is a good first step anyway, as it would be a great preparation even if you do not succeed with the DIY work, and decide to move on to one of the other options. You may want to do the free on-line Davis assessment right now, which will give you an immediate indication of whether our programme is likely to benefit you. This breakthrough book is changing how dyslexia is viewed - and how it is remedied - worldwide. The new revised and expanded edition contains added information to help with the mental techniques for orientation and attention focus, that are the hallmark of the Davis program. A Must for Home Tutoring and Home Schooling. Davis® Symbol Mastery is a visual-spatial learning process that improves anyone's basic literacy skills. It's fun, even for young children. It is also a crucial component of the Davis Dyslexia Correction®, and necessary for long-lasting results to be achieved. This 4-day (30 hour) workshop was developed in the nineties and it is an introduction to the basic theories, principles and application of all the procedures described in Ron Davis' best-selling book The Gift of Dyslexia. This is a stand-alone workshop, but at the same time it forms the first step of the full Davis Facilitator training. If you are interested in becoming a qualified Davis Facilitator, this workshop is your first step. Traditionally dyslexia has been viewed as a disability and many remedial approaches focus on coping strategies involving drill and repetition. Our approach treats dyslexic intelligence with respect and uses it to address learning problems. Offering a drug-free approach, the Davis Attention Mastery Programme enables people with AD(H)D to master certain logic concepts, which are critical for success in life and learning. These concepts include consequence, time, and order, and help the individual to successfully take charge of his life. Dyscalculia is when a person struggles with maths. This typically happens to learners who need full understanding and hands-on exploration rather than rote learning or repetition. The Davis math mastery programme uses plasticine clay to master the underlying meaning of mathematics. People on the autistic spectrum tend to either love reading or struggle with it. The Davis Autism Approach offers a simple way to help individuals on the spectrum to participate more fully in every aspect of life. We empower parents and carers by providing an insider’s view of autism, as Ronald Dell Davis, the originator of the Davis methods started out in life as a non-verbal autist. The Davis Reading Programme for Young Learners is a 30-hour training for early learners and their parent(s). The child and parent learn strategies to maximize learning and minimize effort. This provides essential tools and skills for early reading success and lays a foundation for lifelong love of learning.